A reader asked me Monday: What’s the story on Tom’s? He understood there had been an ownership change and wondered whether the business would continue as a garden center. On Tuesday I pedaled across the river to find out. Turns out that yes, Tom and Annette Krupicka sold the property to an investment group, LT Investments Three LLC, which has an office on Kings Boulevard in Corvallis. Benton County tax records also list an owner named Richard Cassar, with the same address. The county records say the sale, for $1.6 million, took place on Jan. 4. The property measures slightly more than 2.5 acres. Its market value on the tax records is listed as $2.5 million, and it’s assessed at just over $1 million. The property taxes last year totaled $19,838. I got a chance to chat with the Krupickas Tuesday as they were working in the store. 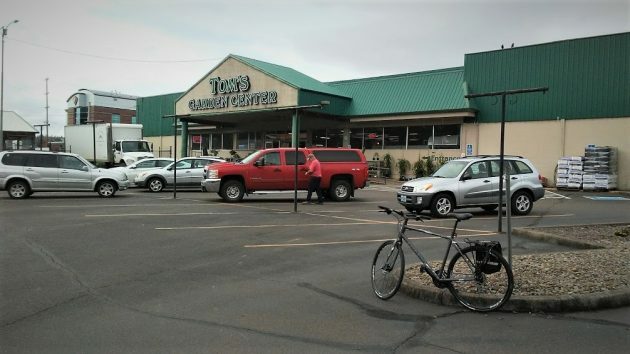 They’ve owned and operated Tom’s in Albany for 30 years this May, first at a site between Pacific Boulevard and the Southern Pacific tracks, and since 2005 at the North Albany location, 350 Hickory St. N.W. Why quit now? Tom told me they’ll miss their customers, but after some 40 years in the garden-center industry they are tired. 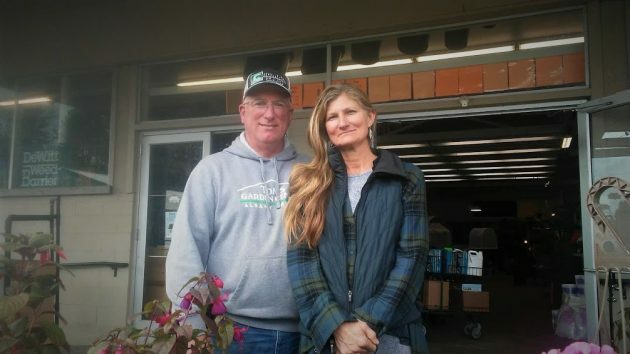 They plan to retire in Tillamook, where they have a home and have lived since 2010, commuting to Albany several times a week. They’ll run the store as normal until the end of May. By July 31 they have to be out. The 14,000-square foot building was a grocery store, Carter’s Market, in the 1970s and ’80s, and later under different owners until it closed. When the Krupickas acquired the property, one of the first things they did was to landscape and beautify the formerly barren grounds up to the highway. A update on this story: I just had an email from someone saying they had secured a lease on the property and intend to continue it as a garden center. More details when I have confirmed them. Tom and Annette Krupicka outside their store on Tuesday afternoon. It’s been great having your gardenstore in the local community. Thank you for being wonderful people, both of you were always very pleasant and extremely helpful when we needed help with our backyard trees. You’ll be missed by us and I’m sure many folks. requirements. Adding the additional administrative expenses costs money and makes running a business a lot less fun. Thus you get what we have here today. A long-standing successful small business closing their doors and selling the real estate. Tom and his wife are just at an age where they are ready to be done, they don’t appear to cite regulations or anything of that nature. I think more than regulation the issue is sky high property prices. Tom bought the store in 2005 for $400k and sold it in 2019 for $1.6 million. For a small business owner the difference in monthly mortgage payments would be quite substantial and limit the types of businesses that would even be able to make it work. The couple is cashing-out after a lengthy, successful career. That is the American Dream. Don’t blame government regulation. Instead, you might thank the American people for having the wisdom to elect and/or hire competent people who work hard to make the nation run smoothly while protecting not just the owner, but all of society. Congrats to this hard-working couple. Now, it’s time to relax. Yes, Tom and Annette Krupicka will be greatly missed. So many times your family and staff have been attentive and helpful in providing great landscaping information and products. The trees, flowers and all items in between. Enjoy your retirement! You both deserve a great many happy years ahead. Sounds like you found a great spot in Oregon to enjoy your special time. To be sure, you two will have the best landscaped home, in Tillamook! Sad days for N Albany, you guys are awesome and part of the community. You’ve helped so many locals beautify their homes and businesses. You’ll truly be missed. A new stage in your lives, well deserved and I’m so happy for the both of you. Happy (second) retirement to Tillamook. So sad to see you guys go, I’ve enjoyed shopping at Tom’s very much. Hate these changes, but your two deserve to enjoy family time and your retirement. Thank you for giving so much to the community! Sorry to see you go. Staff has always been so helpful. Enjoy retirement. Have always enjoyed doing business with you. I still have a really nice nativity set I bought from you when the business was on Pacific. Happy retirement to both of you. Those blooming trees do look nice this spring time of year! Thanks to you both for your many years of service and friendship to this community! You surely will be missed! Non like yours ever again!!!!! It will be strange not to see you there! Thanks for all you have done in the community. Good luck and Blessings on your adventures in Tillamook, Tom’s Cheese? Also housed Food Town and Three Boys Market at one time. Worked there as a box boy. Was there when the Columbus Day storm took out the front windows. That area has had some history and some floods, back in the day. With Tom at the helm you always knew that if you had a question you would get an answer that you could depend on, unlike big box stores where the person you speak to may have less knowledge than you do. Tom was (and is) very polite and a good listener. What a concept!